Five kittens born with extra toes are looking for new homes after being abandoned. Known as polydactyl or mitten kittens, the cats all have more than the normal 18 toes and were found dumped in a back garden near Clacton-on-Sea, Essex. One of them, Murdoch, has 26 toes. Andy Gillon, manager of the Blue Cross rescue centre in Felixstowe, Suffolk, said: "We might get the odd cat with an extra toe, but to get an entire litter of polydactyl cats is really unusual." Cats normally have five toes on each of their front paws, and four on both of their hind paws. A cat with 28 toes, seven on each paw, was found in Ontario, Canada, in 2002 and is the current record holder for the cat with the most toes, Guinness World Records said. Mr Gillon said the kittens, named Norris, Murdock, Angus, Rodric and Kai, were very shy as they had missed out on "early socialisation". 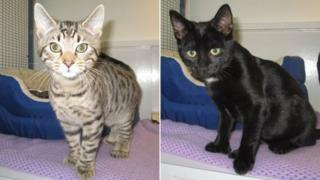 He said: "These kittens have come such a long way since they came into our care in December. "They were extremely nervous and didn't enjoy interacting with people. "Our staff and volunteers have spent a lot of time with them, building up their confidence and getting them used to human company."